118 MMS November 2017 mmsonline.com BETTER PRODUCTION Shops Using Technology S&K MACHINE INC. PROBLEM Needed cutting tools that could complete complex boring and milling operations without chatter SOLUTION Sandvik Coromant's Silent Tools line of cutting tools RESULTS Improved part tolerance and finish Damped Tools Enable Complex Boring, Milling Operations P e r s i ste nt c h at te r c a n b e a ve r y d i f f i c u l t manufacturing issue to solve. Machining shops have turned to solutions such as reducing spindle speeds, increasing the feed rate, taking a heavier depth of cut, changing the nose radius or geometr y of the insert, welding steel to the boring bar, wrapping rubber bands around the outside of the part, sticking strips of lead under the toolholder screws, and more, but these efforts are often not enough. 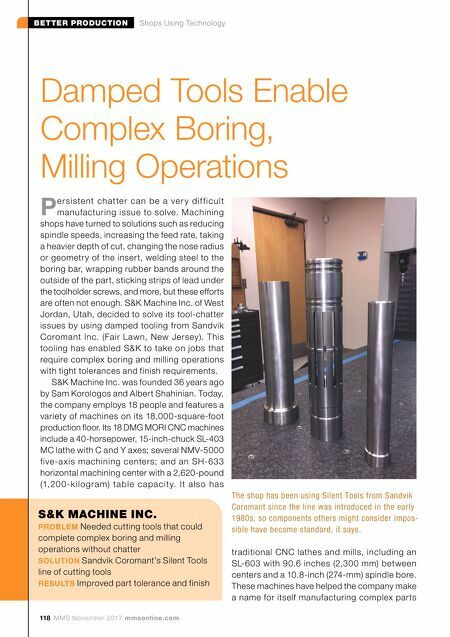 S&K Machine Inc. of West Jordan, Utah, decided to solve its tool-chatter issues by using damped tooling from Sandvik Coromant Inc. (Fair Lawn, New Jersey). This tooling has enabled S&K to take on jobs that require complex boring and milling operations with tight tolerances and finish requirements. S&K Machine Inc. was founded 36 years ago by Sam Korologos and Albert Shahinian. Today, the company employs 18 people and features a variety of machines on its 18,000-square-foot production floor. Its 18 DMG MORI CNC machines include a 40-horsepower, 15-inch-chuck SL-403 MC lathe with C and Y axes; several NMV-5000 five-a xis machining centers; and an SH-633 horizontal machining center with a 2,620-pound (1,20 0 -k i l o g r a m) t a b l e c a p a c i t y. 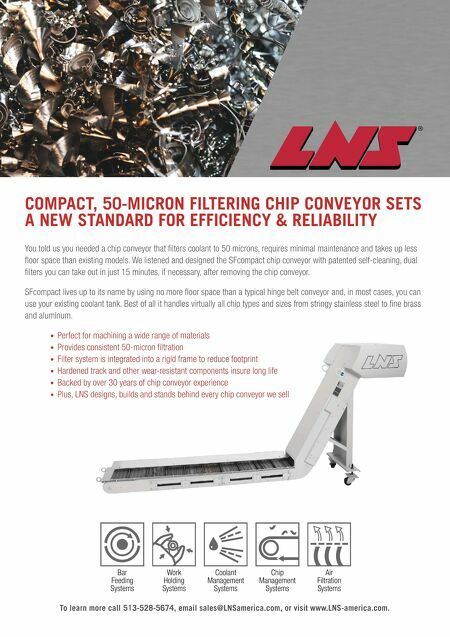 It a l s o h a s traditional CNC lathes and mills, including an SL-603 with 90.6 inches (2,300 mm) between centers and a 10.8-inch (274-mm) spindle bore. These machines have helped the company make a name for itself manufacturing complex parts The shop has been using Silent Tools from Sandvik Coromant since the line was introduced in the early 1980s, so components others might consider impos- sible have become standard, it says.